Meditation is a mental exercise and it enhances the state of awareness. Awareness is the ability to directly know and perceive, to feel, or to be cognizant of events (Wikipedia). The meditative awareness is often called blissful awareness which is a higher state of consciousness. Higher consciousness involves the ability to be conscious of being conscious. Meditative awareness is an awareness of perception; an intuitive awareness. It is a form of calm mental state that upgrades compassion, equanimity and wisdom. It provides a sense of tranquility and peace. Meditative awareness connected with the attention in the present moment self-regulating the mind. This awareness gives profound insight about the body/mind experience with heightened alertness. Furthermore it gives clarity of mind. The meditative awareness helps to analyze the inner being and external environment in non judgmental manner. This process creates a profound mental harmony without any negative emotions. Then the life-stream becomes more focused achieving the wholeness. Then the meditator is living his originality. In meditative awareness feelings and emotions are neutrally analyzed without any fixation. Thus the mediator finally achieves pure consciousness which is called Samadhi. Deshmukh (2006) describes Samadhi as a self-absorptive, adaptive state with realization of one’s being in harmony with reality. It is unitive, undifferentiated, reality-consciousness, an essential being, which can only be experienced by spontaneous intuition and self-understanding. Consciousness has been one of the most important and tantalizing issues ever since the origin of philosophy and medicine (Facco et al., 2017). In general terms consciousness is defined as the state of awareness of self and the environment. In biological terms, human consciousness appears as a feature associated with the functioning of the human brain (Gierer, 2008). The English philosopher John Locke stated that consciousness is the awareness of all that occurs in the mind of a person. As described by van Gulick (2004) consciousness is the state or quality of awareness, or, of being aware of an external object or something within oneself. In modern science it is defined as a continuous state of full awareness of the Self and one’s relationship to the external and internal environment, describing the degree of wakefulness in which an organism recognizes stimuli (Jellinger, 2009). According to the biological theories consciousness is some form of biological state of the brain depends on brain chemistry and electrical impulses. Current research suggests that human consciousness is associated with complex, synchronous interactions between multiple cortical networks (Panda et al, 2016). According to Szirmai and Kamondi (2006) higher functions” of human mental ability have been ascribed to the prefrontal and parietal association cortices. The paleocerebrum, limbic system and their connections have been considered to be the center of emotions, feelings, attention, motivation and autonomic functions. Consciousness is a state or function of the brain. It is individual awareness. There are four states of consciousness such as Waking: Sleeping: Dreaming: Meditation. Consciousness is strongly connected with awareness. However there is no conscious perception without attention (Mack & Rock, 1998). The American Psychologist William James postulated that our conscious mental life flows continuously like a stream in which the transition between the thought of one object and the thought of another is no more a break in the thought than a joint in a bamboo is a break in the wood. William James described consciousness as a stream – a continuous succession of experiences. For William James consciousness is something flowing uninterruptedly. Meditation practice is geared to reach higher consciousness. A.K Nair of the Department of Neurophysiology, National Institute of Mental Health and Neuro Sciences Bengaluru, India indicates that Meditation induces a modified state of consciousness that remains under voluntary control. Meditative consciousness is characterized by receptive attention to and awareness of present events and experiences. It constitutes the ability to become aware of mental activities such as sensations, images, feelings, and thoughts, and to disengage from judgment, conditioned emotions, and their cognitive processing or automatic inhibition (Gartenschläger et al., 2017). In meditative consciousness there are no cognitive elaborations or emotional reactivity. This state is characterized by improved task performance and decreased stress-related symptomolog and without maladaptive mental processes. Some experts state that in meditative consciousness brain activation in the left prefrontal cortex can be detected via Functional magnetic resonance imaging. Metacognition is “cognition about cognition” or thinking about thinking”. It is the ability to recognize one’s own successful cognitive processing. It is the individual’s ability to assess their own cognitive ability. Meta-cognition is one of the distinctive characteristics of human mind that enables us to reflect on our own mental states ( Hussain, 2015). Metacognition is important in mental health. Metacognitive impairments are observed in chronic psychosis such as schizophrenia. In addition metacognition impairment are found among drug addicts. The involvement of metacognition in mindfulness is already acknowledged in recent mindfulness models (Norman, 2017). Meta-cognition and mindfulness share many commonalities and are conceptually related in many ways ( Hussain, 2015). Mindfulness involves a metacognitive level of mind that is aware of the cognitions or contents of the mind (Kabat-Zinn ,2003; Hussain, 2015).Some experts believe that mindfulness is related to the highest level of metacognition. Shapiro and colleagues (2006) linked mindfulness to metacognition, arguing that the process of mindfully attending with openness and nonjudgementalness leads to what is referred to as reperceiving. (Norman, 2017). Reperceiving is a principal effect of mindfulness meditation. Abraham Maslow once stated: What is necessary to change a person is to change his awareness of himself. Meditation helps to reveal the inner self. Knowing inner self comes from self-awareness. While practicing meditation the meditator understands the nature of existence achieving a lot of aha moments while reconnecting with inner-self. This process leads to self realization. Once the inner self has been experienced, the mediator gains more wisdom. As described by Swami Krishnananda the concept of Self-Realization can stir up highly balanced outlook of life, a sober approach to every event and factor in life, a policy of impersonality in regard to any kind of encounter in the world. René Descartes described the concept of mind-body dualism in the 16th century (Ventriglio & Bhugra , 2015). For centuries he mind and body has been viewed as distinct entities. This dualism has created boundaries between mind and body and Descartes dogma has caused tremendous amount of damage to Western psychiatry (Ventriglio & Bhugra , 2015). The mind and the body are clearly intertwined (Sullivan & Hudson, 2017). Mind-body interventions are based on the holistic principle that mind, body and behaviour are all interconnected and it incorporates strategies that are thought to improve psychological and physical well-being (Theadom et al., 2015). According to Bonilla (2010) meditation is one of the mind-body healing procedures. Meditation is a method for synchronizing body and mind in the present moment. Research on mind-body exercises such as meditation has indicated significant mental and physical value (La Forge ,1997). Meditation augments the mind-body connection. 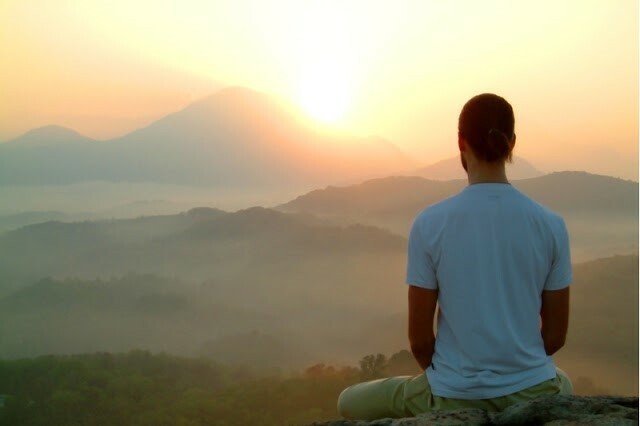 Meditation develop a stronger mind-body connection through heightened somatic awareness and a focus on the present moment (Myers et al.,2015). Developing self awareness is a part of mental training. In general terms self-awareness is the capacity for introspection and the ability to recognize oneself as an individual separate from the environment and other individuals. Self-Awareness occurs through reflection. Developing self awareness is a healing process. It is is a dynamic process of recovery. The power of self awareness is connected with know thyself. Know thyself is a huge part in meditation. Many centuries ago Aristotle wrote: knowing yourself is the beginning of all wisdom. Lao Tzu states that he who knows others is wise; he who knows himself is enlightened. According to Erich Fromm know thyself is one of the fundamental commands that aim at human strength and happiness. Meditation can be viewed as an introspection tool. Introspection is the examination or observation of one’s own mental and emotional processes. Self-analysis is one of the key factors in introspection. The meditation Guru Paramahansa Yogananda concluded; Introspection, or ‘sitting in the silence,’ is an unscientific way of trying to force apart the mind and senses, tied together by the life force. The contemplative mind, attempting its return to divinity, is constantly dragged back toward the senses by the life currents. Meditation is a transformative experience. It can bring true personal transformation. Meditation is a means to (positive) transformations in consciousness (Sedlmeier et al., 2012). Meditation is appreciation of life. Meditation builds internal energy. It is an internal effort that could be used to self regulate. Some call it intention cultivation. This is a process which is called healing from within. Meditation augments growth promotion. Personal and spiritual growth can be achieved via meditation. It is a conglomerate of mental, social, emotional, and spiritual growth. As described by Craven (1989) meditation has five basic components: relaxation, concentration, altered state of consciousness, logic relaxation and self-observation attitude. Subjectively, meditative experience is said to be fundamentally different from “normal” mental state (Neumann & Frasch, 2006). It is a self-transcending experience. It is an active state that causes positive changes in self-esteem. Meditation is a dominant form of mental training. It is a practice of concentrated focus or to engage in contemplation or reflection. It is also called mind cultivation, a form of act of extended thought (a focused exercise). Mediation maintains a moment-by-moment awareness of thoughts, feelings, bodily sensations, and surrounding environment. Meditation stabilizes the mind through focus. Meditation improves attention, self awareness and emotional self-regulation by calming the body and mind. It improves ability to process information quickly and accurately. Mediation helps to achieve inner balance and stability by transforming the mind recognizing natural wisdom. This practice helps to heighten sense of well-being. Meditation sharpens the mind. It is about improving one’s attention, attitude and cognitive skills positively managing emotions. Meditation could boost cognitive flexibility and responsible decision-making. It is a method to maintain stillness and inner calm above all enhance mental development. According to Ott (2004) meditation allows individuals to become compassionate witnesses to their own experiences, to avoid making premature decisions, and to be open to new possibilities, transformation, and healing. Meditation may change brain and immune function in positive ways (Davidson et al., 2003). The meditative mind is an awaken mind. It is calm and serene; it leads to spiritual awaking. Dr Deepak Chopra states that the purpose of meditation is to stop thinking for a time, wait for the fog of thought to thin, and glimpse the spirit within. Therefore meditation opens an optimal healing environment (OHE). Buddhist Meditation ought to be introduced to schools in Lanka. Meditation brings Wisdom to handle day to day living. In our adult years, we wish we were taught Buddhist Meditation in our schools. In years as old people, we deeply regret that Buddhist Meditation was not taught in our schools. Have special Sunday sessions to teach Meditation in our schools ? Time to leave behind the colonial past and rebuild the nation. Over to our leading Buddhist priests and concerned PATRIOTIC/NATIONALIST Leaders from any group to make it so ! Thank you, Dr Jayatunge ! This is a fine article. This entry was posted on Saturday, December 2nd, 2017. You can follow any responses to this entry through the RSS 2.0 feed. You can skip to the end and leave a response.